Yes to school time. I told Becca I wanted to use the same family pictures but use them to describe our family members, and then we would talk a little about some animals and describe how they look too. She said yes, that sounded good. Becca had a hard time with the session today, she was very tired and had lots of coughing, both of which made it hard for her to engage and for me to be sure I was seeing her eye choices correctly. I got out the board with our pictures still on the left side (her left). Then I pulled out four pictures: a boy, a girl, a big person and a little person. Each time I would hold them up and describe them to Becca. Then I attached them to the right side of the board and said I wanted us to try describing the people in our family. I went first and pointed to myself. I said daddy (I pointed to my picture) is a boy (I pointed to the boy) and is big (I pointed to the big picture). I went over what the pictures on the right stood for one more time, then I let Becca have a turn. She looked at Becca first, and I said great, let's do Becca. What can you tell me about Becca? She kept looking at the people side, but not long enough to say any of them were choices. Then she had a coughing fit so we had to wait. After that I asked if Becca was a boy or a girl. She looked around, but on the second prompt she picked girl. Then without prompting she picked big, not little. I said that was right, Becca was a very big girl. Next we let Becca's sister go. She picked herself, and said she was a big girl, touching each picture as she went. I repeated that a couple times. Next I held it up for Becca to go again. She picked her brother this time. I asked if he was big or little, and she said big after a short delay. I asked if he was a boy or a girl and she was slow to answer. Actually I think she was slow to answer that question every time. She wasn't super engaged and she might have been a little annoyed and thought it was obvious question, not sure. She did eventually pick boy. I tried to model again how we can use picking different pictures to make a sentence. I did Becca's brother again, showing that we could say he was a big boy by selecting those pictures one by one. I held the board up again for Becca and asked if she wanted to talk about anyone else. She picked mommy this time. I asked if she wanted to say anything about mommy and she quickly chose big. I asked if she wanted to say anything else about mommy. She had another coughing fit, and after getting re-settled again she picked boy. I laughed and said that was silly, mommy is a girl, not a boy. I asked if she was trying to trick me. She looked away, not sure what that meant. I modeled saying mommy is a big girl again. I asked if Becca wanted to talk about anyone else, but she wouldn't look at the board anymore. After that we looked at a couple pictures of animals but only because I'd promised to. I told Becca we'd work more on the animals next time, but that she seemed very tired and we should probably be done for now. School time was a go. I told Becca we were going to play a game called Becca says, where she gets to pick a person in our family and have them perform an activity. I showed Becca a picture of each member of our family, then attached all five to the left (her left) side of the plastic communication board. I let her look over them and she looked around at all the pictures in a circle a couple times, then back at me. Then I showed her three pictures, one of a person dancing, one of a person singing, and one of a person jumping. She would look at the picture and then look at me, and I'd say what each of those pictures meant. Then I attached all three actions to the right side of the board. Then I explained again that we were going to take turns picking a person, and then picking an action for them to do. I asked her to first pick a person and she looked quickly and for a long time at mommy. Then I suggested she pick an activity for mom to do. 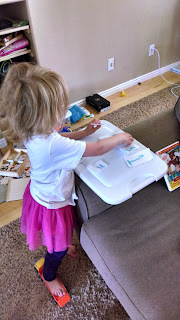 Her eyes would dart quickly back and forth between the people and the activities, and I wouldn't count it unless she sustained gaze, but she darted back and forth quickly a lot for this activity ("Mommy jump daddy sing brother sing sister dance" in like three seconds). After some prompting she looked long at the "jump" picture so I called out to mommy and asked if she would come jump for us. She came over and jumped up and down. Becca got a big smile on her face. We took turns letting Becca and her sister pick (and her brother occasionally when he was interested). Becca chose difference people and different actions clearly. She would spend extra time looking at the people side, and sometimes it seemed like she wanted to change her person choice, but I wouldn't let her, I'd tell her that we'd already chosen a person and now we needed to pick an activity. After some more prompting she would pick an activity. After the first time Becca chose to have her brother sing a song (which he did, with a lot of help), daddy dance, Becca sing a song (we sang one together), mommy jump again, brother dance, mommy sing a song, and maybe a couple other choices. Becca's sister would also choose some, though the only one I need to bring up is when she had daddy jump. Becca got a really big smile on her face and the next time it was her turn she had daddy jump again. One time in there I also picked and had Becca dance, and we danced together. She liked that, but she didn't like "jumping" in her chair when her sister picked that, it stressed her out a little bit. I told Becca I wanted to work on plus one again, she said yes to school time working on plus one. Huzzah! We got out the plastic board and did the same approach as last time, "__+1=___" on the bottom, with three options on the top. I first went through 1-4 in order. I'd fill in the first number ("1+1=___") and then ask Becca what came next ("one plus one equals... what?"). I'd read off her three options at the top, mixed up each time. If she didn't answer right away then I would talk about how plus-one is like counting, we try to figure out what number comes next. Then I'd count up to the number and stop right before saying the next number (i.e. "four plus one, that's one, two, three, four..."). For 1+1 she immediately looked at 2 (even before me pointing out the choices) and back at me. I moved 2 to the right spot on the board and we celebrated (I would wobble the plastic board so it made a funny noise and sort of fanned her face, and I'd sing the number to the tune of the Braves' war chant, "twoo-ooooo... twooo-ooooo"). This made Becca smile every time. For 2+1 after I paused, she didn't pick. I then showed her the choices, and asked again. She started right at 3 for a long time. I said that was right, moved 3 to the answer spot, and we celebrated. For 3+1 after I paused she didn't pick. I showed her the choices and asked again. Still no choice. Then I did the counting thing. After that she looked at 4 and back at me. For 4+1 she immediately picked 5 after I showed her the choices. Next I said I wanted to review some of them and asked if that was ok. She said yes. We started with 2+1 again. She wouldn't pick, even after me showing her options and counting up to 2. She kept looking away instead of at the numbers. It could have been because her little brother started saying "tree" after my "one, two..." every time. Or it could have been she was annoyed that I'd already asked. Either way, I eventually said it was three and we drew a 3 in the air with her hand. I asked if she could find the 3 and she looked at it and back at me. Celebration song again. She's going to be so bored in school..
Next I did 1+1 again, and she rocked it with a smile on her face, no prompting other than to ask "what is 1+1". Next I said I had a hard one, 4+1. Again she picked the correct answer without needing them to be listed. Celebration again. I told Becca she was really smart and I was impressed she was getting better at her plus ones. I got a little behind, so this will be more of a summary. Becca said yes to school time. I told her I wanted to practice our numbers one through five some more and make sure she can find them. She said yes she'd like to do that. 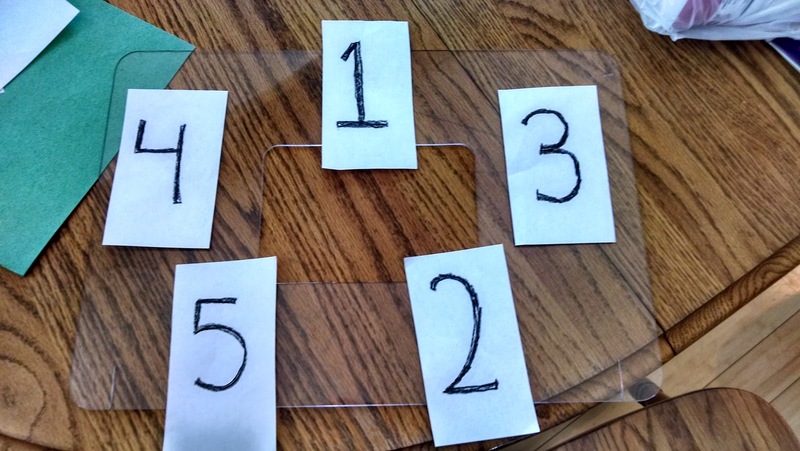 I got out the plastic board and taped the numbers 1 through 5 on it (same papers that we drew last week). I held up the board for a minute so Becca could look at all the numbers. 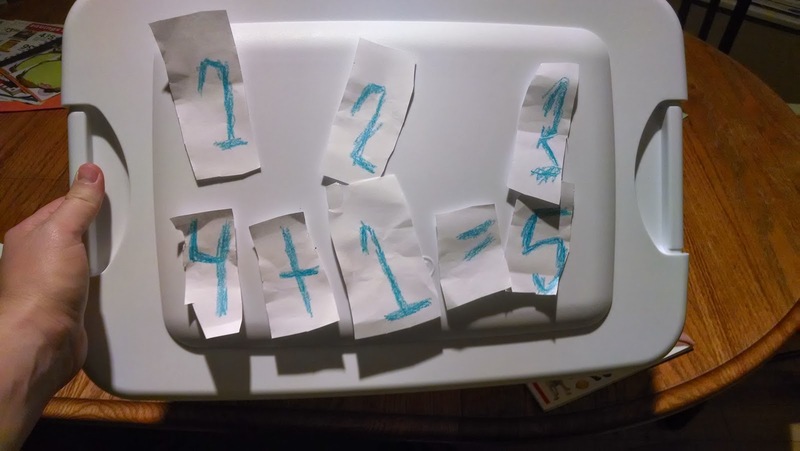 I believe we also went over them before starting, me pointing to each number and asking Becca what it was, then saying the number when she looked at me. Next I asked Becca if she could find the "1". She immediately looked at the 1 and then back at me. We celebrated by clapping 1 time. Then I suggested we should ask mommy to make one silly noise. Becca said yes, that sounded like a good idea. After Becca looked at Paula from across the room she made on silly noise. Same with 2, she found it right away, looked at the number and then back at me. We clapped twice, then asked Becca's sister to make 2 silly noises by looking at her. For 3 she looked immediately at 3, but then she wouldn't look back at me. I pointed to the one I thought she was picking and asked if she thought that was the 3, and she said yes. We celebrated. I asked if she wanted me to make 3 silly noises. When she said yes then I did. I asked if she liked the silly noises and she said no. I asked if I should try another silly noise and she said yes, so I tried another one. She smiled really big and I asked if that silly noise was better and she said yes. For 4 Becca wouldn't pick the 4. She would look around and ended up sticking on the 2 a lot, but not looking back at me. I told her that was a 2, not a 4. I drew a 4 with her in the air with her hand and asked if she could find that number. She eventually did look for a long time and the 4 and we went with that, asking mommy again to make 4 silly noises. 5 was similarly slow, but she did eventually pick it. She looked at 2 a lot again, and Becca's sister pointed out that a 2 is like an upside-down 5. Becca's sister did 5 silly noises in celebration after our five claps. Also after school time I told Becca I was impressed with how smart she was. I asked if she thought she was smart, and she said no (looking at me momentarily and then looking away). I told her of course she was smart. I started listing all of the things she had learned both at school and home since the school year started, and how those were amazing things to learn. She got a smile on her face as I started listing them (it took a little while to list them all). I asked again if she thought she was smart and this time she said yes with a smile. I asked Becca if she wanted to do school time and she wouldn't say yes. I explained that we weren't going to work on drawing today, we could work on numbers instead. I wanted to practice doing "plus one" with her, and looking at our numbers. I asked if she wanted to do that for school time and after a few seconds she said yes. We got all seated at the table, and went to get started. We had some sibling tantrums we had to work through so it was quiet enough to focus, but then I said I wanted start by writing down what each of the numbers looked like, then we'd practice some plus one's, then we would work on the numbers a little bit more. I said the first number was one. I asked Becca if she remembered what a one looked like. She wouldn't say yes. I asked if she wanted to draw it with me and she said yes. I held her hand and we drew a one on a sheet of paper. Then I asked if she knew what number came after one. She said yes. I said yep, two comes after one. I held up one crayon and said "when we have one crayon and add one more, we get two" and added another crayon. I did this for every other number as well. We repeated the same process, she remembered what two looked like and was willing to draw it with me. She also remembered what came after two, and she remembered what a three looked like, and she wanted to draw it with me. She wouldn't say that she remembered what came after three, so I told her it was "one, two, three..." I waited until she looked at me, then I said "four". She didn't remember what a four looked like, and she didn't want to draw it with me, so I drew it for her and showed her the four. She said she remembered that five came next, but she didn't remember what a five looked like, but she did want to draw it with me. Next I drew a couple more things for our activity. I put "__+1=__" on the bottom part of her plastic board. Then I would attach three numbers up above and put a number in the first blank. I talked about how "plus one" was trying to figure out what number came next, and how it was like when we measured things and sometimes our number wasn't quite enough, we had to "add one" more to get it high enough. I asked if she wanted to try doing some plus one's. She said yes. I put "1+1=" and stuck on the numbers 2, 4, and 3 as options. I showed Becca the board and said we needed to try to figure out what was one plus one. She immediately looked at the 2. I talked a little bit more about how that means we need to figure out what number comes after 1, and how if we have one (held up one finger) and add another one (held up another finger), then how many does that make? How much is one plus one? Again Becca looked at the 2 and then back at me. I said that was right and we celebrated. Next I put "3+1=" and stuck on numbers 2, 4, and 5. We did the same thing. Becca wouldn't pick one of the numbers. She looked at all of them but wouldn't pick. We worked through the same hints, but she wouldn't pick. Then we counted from one up to 3, and I paused and waited. When she looked at me I said, "4". I asked if she could find the 4 and she picked the 2. I said that was a 2. 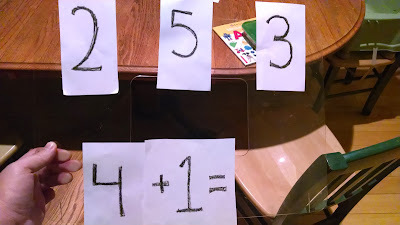 I showed her which one was the 4 and we practiced tracing the 4 a few times. After that I put "2+1=" and stuck on numbers 2, 3 and 5. Same review. Becca looked at all the numbers and after a delay she looked for a long time at the 3. I asked if she was picking the 3 and she looked at me. I said that was right and we practiced drawing the 3. Next was "4+1=" with the numbers 2, 3 and 5. Again she had a hard time picking. Eventually we counted up and Becca looked at me and I said 5. I showed her where the 5 was and we practiced drawing it. I said it seemed like she remembered 1, 2 and 3 pretty well, but 4 and 5 were harder for her. We did "2+1=" one more time and very quickly she picked 3. Then I took off all the signs and put 1-5 randomly on the board. I showed Becca the board and told her I wanted to play a finding game, and see if she could find the numbers. We went over them together one time, tracing them and counting up from 1 to 5. Then I asked if she knew where the 3 was. She looked around and after a moment she stared for a long time at 3. I asked if that was 3 and she said yes. I said that was right and we cheered. Then we did 1 and she found it right away and looked back at me. Next we did 4. She looked at 2 and back at me. I said that was a 2 and we traced the 2 again. She looked at 3 and almost back at me but then away. I said yeah, that's 3 not 4. Then she looked at the 4 and back at me. I said yes, that's the 4 and we celebrated. 2 was next, and she got that one very quickly. For 5 we had some coughing interruptions and ended up doing a hand game before trying again. After we came back to it she looked at all the numbers and eventually looked at 5 and then back at me quickly. I said yes and we celebrated again. First time I asked Becca said yes to school time. Then when I got her seated and ready I told her I wanted to work on drawing pictures, I asked if she wanted to do that and she wouldn't say yes. I asked if she wanted to work on pictures and she clearly said no. I tried explaining to her that I wanted to talk about how different ways of drawing and bright/dark colors can tell people about how we're feeling when we draw the pictures. Did she want to learn about that? Another clear no. I told her it was ok that she couldn't draw all by herself, I was going to try some different drawing tricks with her to see what we could draw together. Can we just try drawing one page? Another clear no. Well, stubborn me, I said sometimes we have to learn things even if they don't sound fun, so let's just do one page and then be done. I didn't ask that time. I drew a couple pictures with different colors and showed her and talked about how the dark ones seemed more sad and the bright ones seemed more happy, how the colored-in ones seemed a little more realistic, etc. She kept coughing and looking away. Then we did a quick hand game, which she thought was fun and funny. She re-engaged for a minute, until I started talking about drawing again. Once we finished one page I asked if she wanted to be done and she wouldn't say yes. I asked if she still wanted to do school time and she said yes. I ran through some other ideas of things we could do for school time, working on numbers, letters... she wouldn't say yes to anything. I said that was fine, we could just be done then. Well, she definitely has an opinion :-). I guess she either wasn't in the mood for drawing, or doesn't really like drawing all that much. Incidentally, Paula said this was a lot like what she was like the first time Paula tried to do school time with her. Good to know I'm not the only one who's run into Badditude Becca. I asked Becca if she wanted school time today and she said no. I asked if she thought yesterday was boring and she said yes. I apologized and explained I wanted to try again today only talk more about things she could do rather than things other kids would do. I asked if she wanted to do school time today like that and she said yes. This time I had pictures of things Becca could do (holding hands, giving a hug, looking at someone with a smile, crying, pouting, not holding her head up, not making eye contact). I would hold up the picture and ask Becca if she could see it. She would usually look for a couple seconds and then look away. I would ask Becca's sister what it was a picture of, and she would say. I would ask Becca if she ever did that thing or felt like doing that thing. Then I would hold up the picture between the happy and sad child and ask Becca if when she did that thing it made people feel happy or sad. Becca would still look at the happy child a lot, and whenever I wasn't talking she would go back to staring at the child. I had to start holding the board down next to Becca so she would focus on other things, and even then sometimes she would look back down at the board after a little while like she wanted to see the happy child some more. Maybe this is why people use picture symbols instead of pictures.. I asked Becca how it made her feel when people gave her a hug. She was looking at "sad" when I asked, and she looked up and around the board over the happy, then at me. I pointed out that it looked like she didn't want to confuse me by looking at sad and then at me, and that made it more clear she was picking happy, so thank you. Next was the picture of a child looking at their mother smiling. Becca looked quickly at this picture. I held it between the two options and she looked all around, at all three pictures. After a little while she looked at "happy" and back at me. I confirmed, and she said yes again. I said definitely. I said it always made me happy when Becca looked in my eyes and smiled. I asked if she knew who else it made feel happy. I asked if she thought it made her sister happy, and she said yes. I pulled her sister over and she nodded and smiled. I asked if she thought it made mommy happy, and she looked over at mommy in the kitchen and smiled at her. I told her it also made her brother happy, and her grandparents, and pretty much everyone who saw her. When people at church came to talk to her, they know she can't talk, they're not hoping she will talk to them, they just hope she will look at them and smile because it will make them feel sooo happy. Last we looked again at all the pictures of things that make people happy and talked about how we can always try to help other people feel happy. It's ok to feel sad sometimes, but when we are happy to people then they feel happy and then they do things that make us feel happy when we're sad, and that's how we become friends. Yes for school time. I held up the plastic board with two pictures, a happy child and a sad child. Pretty quickly I realized we had a problem because Becca was very fascinated by the picture of the happy child, she wouldn't stop looking at it and it was making it hard for her to answer questions. First we talked a little bit about how some of the things we do make people happy and some make them sad. Then I would hold up a picture of a child doing something, and ask if when a person does that thing it makes others feel happy or sad. The pictures were of things like a child sharing ice cream, a child falling asleep in class, a child yelling at their mother, a child running in front of a car. etc. This was probably Becca's least-successful communication session, she wouldn't pick hardly any of the time whether the reaction was happy or sad. Either she would look back and forth between the two pictures over and over, or she would stare at the happy child and then look away. She was also pretty unhappy. I realized after a little while that none of the pictures really applied to Becca in that they were things Becca could do. We stopped at that point and I explained it was important for her to understand that kids do good things and bad things, and that can make people happy or sad. Sometimes people do mean things or nice things to Becca and that makes her feel happy or sad. She still wasn't very attentive. Then I started talking about things Becca could do that would make people happy or sad. Right away she perked up and smiled and paid better attention. I talked about how she can reach out and put her arm on people or hold their hand, and how that makes them feel so happy. Or that she can look in their eyes when the come visit and that makes them feel special. She looked much more attentive for that part, and stopped looking away as much. I still used the board to point out things she does that make people feel happy or sad, just pointing to them, but I didn't ask anymore questions because I thought she was probably done with questions for the day.